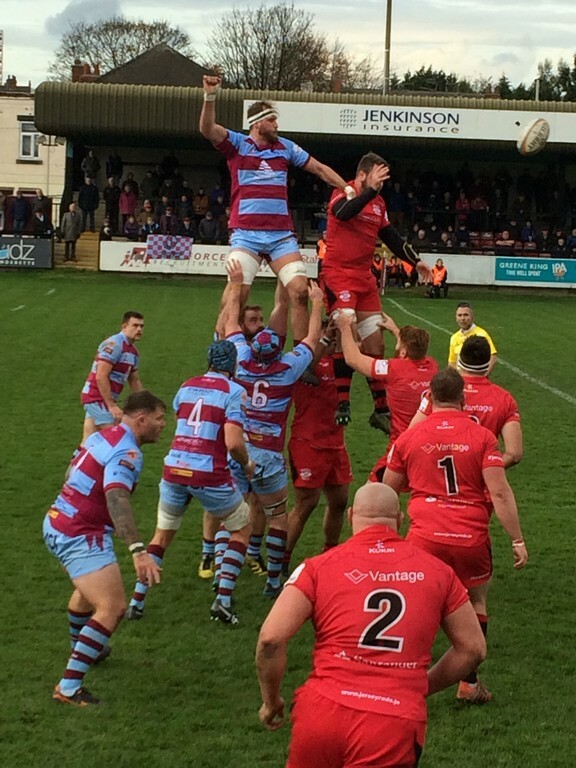 Rotherham Titans put in a disappointing display as they crashed 45-14 at home to Jersey Reds to leave them rock bottom of the Greene King IPA Championship and without a win after nine games of the campaign. The gap to London Scottish, who are eleventh in the league has widened to 13 points, leaving the Titans with a real fight on their hands if they are to avoid finishing bottom of the pile this term. Jersey wasted little time in making an impact as winger Tom Pincus raced over for the first of his three tries after just 2 minutes, with fly half Brendan Cope adding the extras to give the Islanders a 7-0 dream start. To be fair, Titans then enjoyed the majority of both territory and possession over the next 15 minutes, as they pressed the Reds and caused them to concede numerous penalties. From three such penalties Titans fly half Caolan Ryan stepped up and convincingly knocked them over to nudge Rotherham into a 9-7 lead. The visitors however came back with real force and through their big set of combative forwards had considerable success as they forced the Titans backwards. The pressure told on 22 minutes when flanker Seb Nagle-Taylor peeled off a driving maul to race in virtually unopposed. Brendan Cope nailed the extras and a penalty just after the half hour mark to close out the first half with the Reds holding a 17-9 advantage. Rotherham made a bright and breezy start to the second period and it looked as if they’d pulled themselves back into the game just 2 minutes in when winger Drew Cheshire showed electrifying pace down the right wing to dot down. Unfortunately for him and the Titans, the Assistant Referee flagged to denote Cheshire had just gone into touch close to the line. Chances for the home side thereafter proved scarce. A dominant period followed for the Reds as they scored 21 unanswered points. First of all lively scrum half Kieran Hardy helped himself to a brace of tries on 53 and 65 minutes, before winger Tom Pincus collected his second try on 76 minutes, all of which were expertly converted by Cope. Rotherham battled on gamely and Charlie Maddison gained some reward for his efforts when he crashed over in the final minute for Titans sole try of the game. However, the final say went the way of the visitors as winger Tom Pincus collected his hat trick in stoppage time to round off a disappointing day for the South Yorkshire side. Speaking post-match Titans Andy Key honestly reflected, “We were not good enough on the day. I think the players said it in the huddle and very passionately and honestly as well and there’s no getting around it we were just not good enough today. “There were a lot of good things that went on in the week and we knew what we needed to do; we rocked up at times, but rocking up at times isn’t good enough, we’ve got to be there for the majority. And then you start forcing things and then you give away interceptions. “When you start playing catch-up rugby things start going against you; I’d rather we didn’t do that, but it’s a reflection as well of what the players are prepared to do, to try and get themselves back in the game. It’s been a massively disappointing day. “We’re not hiding from anything, today was massively important and we genuinely believed in the week, with the things that we did and the homework that we did on Jersey, we thought we knew how to beat them. “Early on in the game, although they got an early score, we clawed ourselves back and created some opportunities. We just needed to persevere with what we were doing. We probably didn’t work hard enough at times, in order to get ourselves onto the front foot in the first half and we maybe should have played a little bit more territory at times. Titans: 15 Ben Foley, 14 Drew Cheshire, 13 Yiannis Loizias, 12 Luke Peters (Millar 53), 11 Jake Henry (Tibbetts 46), 10 Caolan Ryan, 9 Rhodri Davies, 1 Tom Williams (Toby Williams 54), 2 Luke Cole (Murphy 62), 3 Matt Shields (Palmer 62), 4 Adam Peters (Postlethwaite 68), 5 Byron Hodge, 6 Tom Calladine (Capt. ), 7 Charlie Maddison, 8 Ifereimi Boladau (Grange 10). Replacements: 16 Jonny Murphy, 17 Toby Williams, 18 Brandon Palmer, 19 Matt Postlethwaite, 20 Dan Grange, 21 Logan Tibbetts, 22 Lee Millar. Jersey Reds: 15 Auguy Slowik (Bryant 58-68 HIA), 14 Tom Pincus, 13 Apakuki Ma'afu, 12 Ellis Abrahams, 11 Josh Hodson (Bryant 68), 10 Brendan Cope, 9 Kieran Hardy (Dudley 66), 1 Jake Woolmore (Capt.) (Godfrey 64), 2 Nick Selway (Saunders 52), 3 Jake Armstrong (Atalifo 59), 4 Jerry Sexton, 5 James Voss (Quarrie 62), 6 Conor Joyce (Kolo'ofa'I 65), 7 Seb Nagle-Taylor, 8 Matt Rogerson. Replacements: 16 Jared Saunders, 17 Roy Godfrey, 18 Leeroy Atalifo, 19 Tom Quarrie, 20 Uili Kolo'ofa'I, 21 Joel Dudley, 22 Oli Bryant.